Straddle the NV - AZ Border! This description is for the Black Canyon section of the Colorado River, from the Hoover Dam to Willow Beach. This is a 12+ mile paddle that is often done as an overnighter. Permits must be obtained from the National Park Service. Note that it is NOT possible to do this trip by self-shuttle. The Bureau of Reclamation, the NPS, and Army Corps of Engineers collaboratively operate a security checkpoint at the to the road below the dam. Therefore, you must work with a local outfitter who is certified by the NPS. The trip can easily be done in a day, but two days would provide more time for exploring side canyons, hot springs (there are five named hot springs with the immediate Black Canyon area), and swimming! Both canoes and kayaks work well on the slow moving waters. The dam release is often during the night, and it is unlikely to affect a paddle trip. If anything, you will notice slightly higher water levels, but the current generally stays constant. There are several sandy beaches that provide good camping opportunities. Powerboats are not allowed up river of Willow Beach on the weekends, which makes the paddling experience much more authentic and wild. The current of the river is mild, and head winds can make you feel like you're paddling on a lake at times. 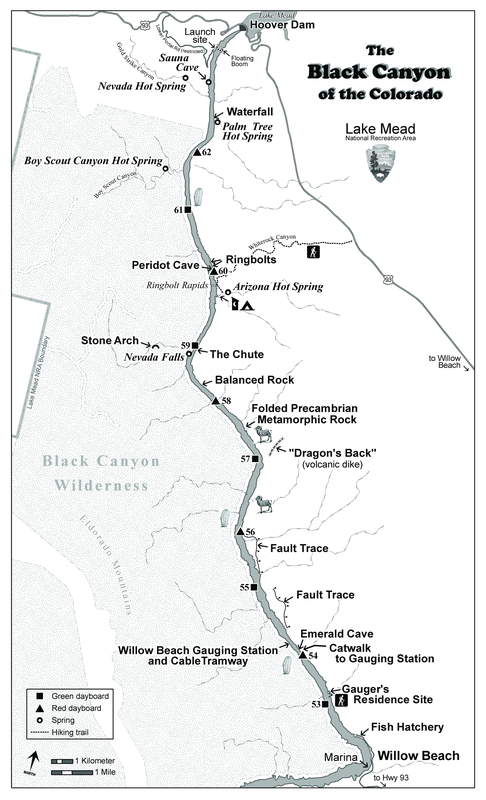 See Black Canyon pdf for map and further points of interest. This will depend on where your outfitter will be meeting you. From Kingman, Drive N on US93 for 57 miles. Turn west onto Willow Beach road. Park at the marina.